In painstaking detail, the art of Mirka Hokkanen captures the sheer joie de vivre of being a dog. Her hapless mutts take pride of place in lovingly rendered etchings which are accompanied by circumspect tributes from Rodney Dangerfield (“We call him Egypt, because in every room he leaves a pyramid.”), Aldous Huxley (“To his dog every man is Napoleon, hence the constant popularity of dogs.”), and others. Not even a confirmed cat lover could resist her street-smart pup parked under a For Sale sign: “Buy 1 dog, Get 1 flea.” Five of Hokkanen’s canine etchings hand-finished with watercolor are currently featured at fly, 904 Broadway. “The subject of my art has always been animals and nature,” says the artist, who was born in Helsinki, Finland, and moved to the US to attend college in Illinois, in 1998. 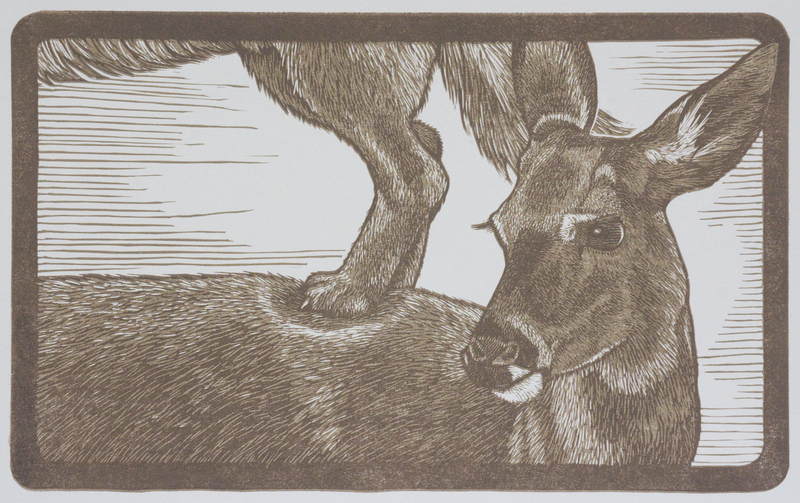 With a fine touch, she employs a variety of printmaking techniques to craft her work. 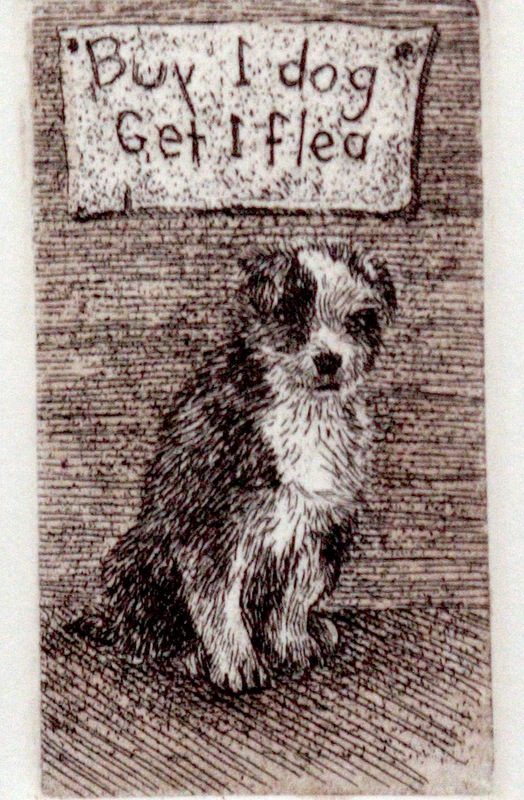 The witty dog miniatures reveal a close observation of her subjects (at about 1.25″ tall, each etching is barely larger than a postage stamp but printed on a larger square of paper suitable for framing. And the line work “is so delicate you almost need a magnifying glass to see the detail.”). Hokkanen’s work is delightfully humorous on the surface, yet – through its rigorous attention to gesture and detail – it also suggests a more empathic and thoughtful undercurrent as it relates to animals. Examples of this can be seen in Inching Closer, an exhibit she is preparing for La Familia Gallery in Seattle, Nov. 4-27. This body of work considers the way wild animals are being squeezed out by sprawling suburbs – and how they might fight back, through well-organized “spying operations.” Influenced by classic folktales as well as George Orwell’s Animal Farm, Hokkanen has created a universe where a mouse can man a tiny outpost nested on the ground, and “hoist a little container up a string to [a] tree where another mouse can hang a red flag to notify other animals” of approaching humans. Though the image is charming, it succeeds in making the viewer see the world through a threatened creature’s eyes. Hokkanen is based in Dupont, WA, where she takes walks in the woods and views firsthand wildlife including deer, raccoons, coyotes, squirrels, chipmunks and bald eagles. She remains close to her Finnish heritage, and has embarked on a long-term cultural project to find and preserve traditional wall hangings hand-embroidered by Finnish women over the past 100 years. Information on ongoing projects, exhibitions and printmaking classes is available at www.mirkah.com.